As suggested by my blogger friends I am glad to share a few pictures as a separate post. The Resort where we stayed. 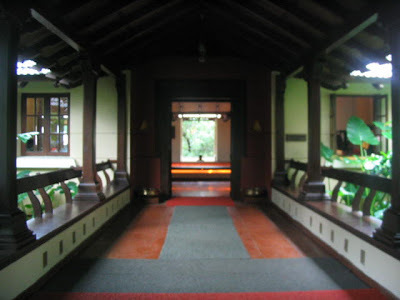 The Mangalorean style entrance of the resort. The Beautiful valley of Coorg/Kodagu in Karnataka. The pretty Madikeri town.Kodagu district. 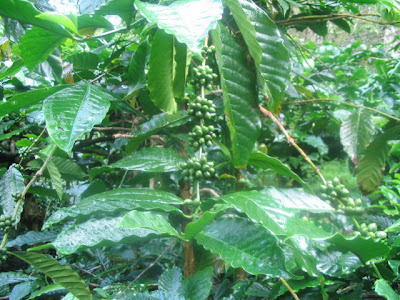 The Coffee plant bearing the berries. ..The Abbey falls.We were warned not to go near as the monsoon water rush proved to be dangerous. 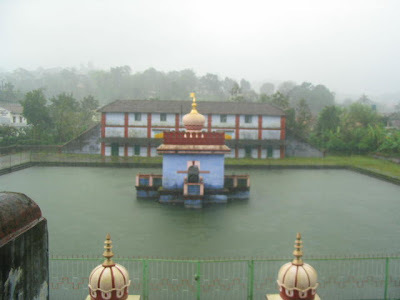 The well maintained Omkareshwar Temple of Lord Shiva, Madikeri. The Temple tank.One can see the unique combo of the Persian Muslim dome with the Hindu Golden Flag atop!!.. 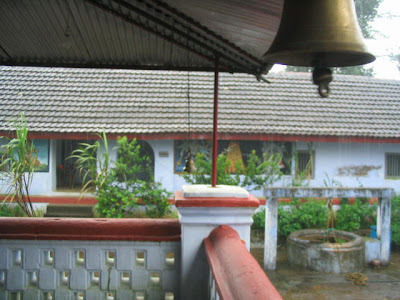 The 'Raja's Seat' of Madikeri,Coorg. 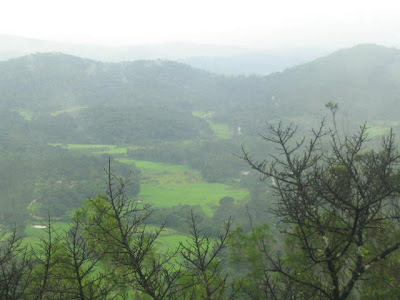 King Vira Rajendra Wodayar ,the last king of Kodagu, is believed to have watched the sun setting behind the beautiful misty mountains, from here.The view from this point is the pic no 3, up!. We also experienced the adventurous and the exciting,"White water rafting" of Dubare. If you ever get a chance to do this anywhere, please go ahead.Those who do not know swimming(like me) must surely try ;).. The drive up to the source of the River Cauvery, Tala Cauvery, and a holy bath there, washed away all our sins..:D..
Asha has a handful of childhood memories associated with this lovely place...this is specially posted for RCI-Karnataka hosted by this lucky gal :). By the way, this is definitely NOT a cruel intention to turn her homesick and nostalgic while busy doing her fabulous round up.. ;)..:D.. 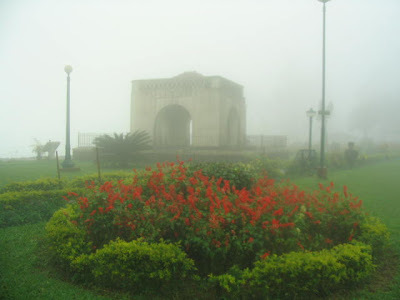 I have been to Coorg too Bharathi.Its a beautiful place with even beautiful people. thankis for these pics, bharathy. this is a beautiful place. I have been there many times and its always cool and beautiful, thanks for the pics feels close to home.Guess you have very nice time there. Bharathy, I wish I was there with you girl.When I saw the Temple, Raja's seat , coffee plants and Abbey Falls, my heart skipped a beat. I almost had tears in my eyes, and I am not a very emotional person! My dad was a judge there in Madikeri Civil court for more than 5 yrs and used to live near the college up the hill if you have seen it. Thank you so much for this post.I will show Arvind too, he is out now. Hugs Bharathy, more photos if you have please! And thats where you have been... Vacation is yr way-of-life, I reckon ;). Beautiful pics though, Bharathy. I have never been to a coffee plantation before! Glad to know you had such a nice time! Now start cooking!! have never been to coorg. but would love to visit. great snaps, Bharathy..u had a great time , i bet!! 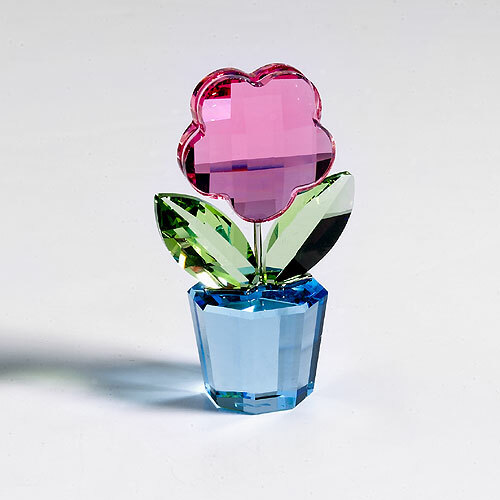 Remya,I was sooo happy to see you with your cute updated posts,dear! 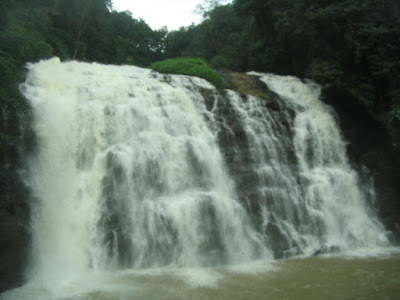 Sreelu..we have fantastic spots in south India! Asha, Sorry to drive you emotional honey. :(...will surely send more,but not now..don't wanna spoil your mood while doing the round up,dear!.. This year,Suki..I am out with more holidaying..:)..thatz all..
Oh Yeah,Sona...Relaxed with no cooking and house works!..:).. Great pictures Bharathy...looks like you had fun..very nice...and a unique entry.. They are just out of the world beautiful pics Bharathy ,thx for sharing. Looks beautiful Bharathy. I love vacations in India. The hills, and coffee estates look amazing. Thanks for sharing, I would love to go visit this place now. coorg girls nalla sundarikuttikal aanennu kettittu undu,aano:) hope u had a nice time. Those are some very fantastic pics.. hope you had a great vacation.. Cool pics Bharathy. Never been to coorg before. It's so nice of you to share this. Very nice pics. Coorg is indeed a b'ful place. heaven on earth i would say. 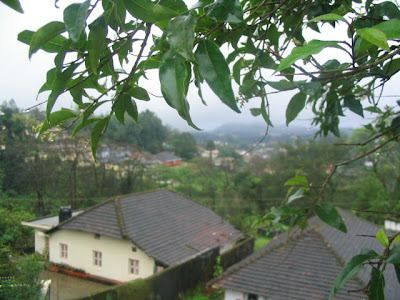 Bharathy - Coorg/Kodagu is not lik Kerala. The food is very distinct. Though there is influence of coconut, it definetly is different. I am a coorg and i have been in Kerala too. Also, the landscape is very different,though it is green alike kerala, it is mostly made up of mountains and streams and coffee estates. There are no beaches or seashores. Coorg is distict and the pepople of coorg and their language, food, dress, looks are far different and does not resemble any south indian regional people or places. Though, in recent years there is influence of certain ingredients that is used in cooking. I am pleasantly surprised to see your comment in my place! 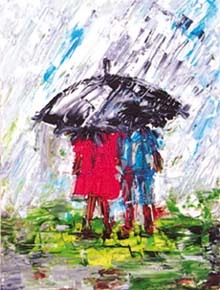 ..:)..
Nice to note that you are from Coorg!.. Just meant to say Coorg is "more or less" like Kerala..Yes the food is a little different from Kerala and supports Kannadiga food...But the climate is almost the same...Rains till September etc..
Why so much of research?We enjoyed every moment there..One of our best holidays in India...The resort was great..esp the food! 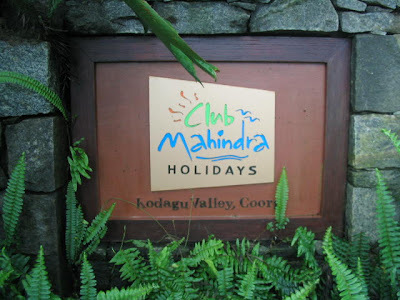 !..We enjoyed the Coorgi dinner served in the resort and the leaf lunch in Adithi of Madikeri..!!.. The only part which set our mood off were those pathetic roads leading to the place from Mysore!.. 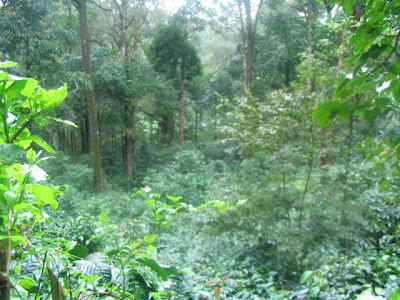 Coorg attracts mainly the local tourists as of now. If the Govt shows interest in better conveyences,for sure,we can promote foreign tourists as well..
Visit us for a virtual trip to Coorg! My favourite Cook book and a few facts. GBP-Curry leaves powder-Preserve the Greens!..